After the success of my key lime pie ice cream, I wanted to experiment with other citrus-based flavors. Around the holidays, I made a cranberry orange ice cream that won rave reviews from everyone who tasted it. (It was especially yummy with a spoonful of raw cranberry-orange relish leftover from Thanksgiving.) I didn't make note of the proportions of ingredients that I used, and perhaps I should have so I could post the recipe here. Sorry for that. 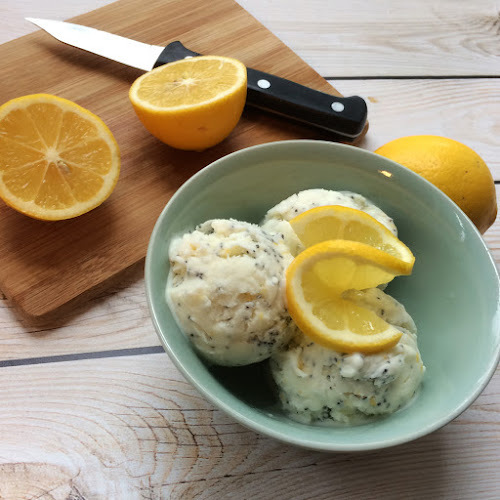 It's currently Meyer lemon season, and I figured they would make a flavorful frozen treat. I tossed in some poppyseeds as well, to mimic the popular muffin and quickbread flavor, and also to add some texture. If you don't have Meyer lemons, don't fret - regular lemons will be just as delicious. Grate the peel from the lemons with a microplane or other fine gauge grater and set aside. Juice the lemons and place the juice in a non-reactive saucepan with the 1/4 cup of sugar. Bring to a boil, stirring to make sure the sugar has dissolved. Pour the syrup into a lidded container and refrigerate until ready to use. Mix 2 tablespoons of the whole milk with the cornstarch to make a slurry. In a separate bowl, whisk the cream cheese and salt together until smooth. Prepare a shallow ice bath: in a large bowl or baking pan, place an inch or two of cold water and several ice cubes. Set aside. Cook the remaining milk, cream, 1/3 cup sugar, corn syrup, and reserved lemon zest in a large saucepan until it comes to a rolling boil, Boil for 4 minutes, watching carefully so it doesn't boil over (stir when it starts to expand), remove from heat, and slowly whisk in the cornstarch slurry. Bring back to a boil over medium-high heat and cook until slightly thickened, about 1 minute. Blend a few tablespoons of hot milk mixture into the cream cheese to loosen it, then pour the cream cheese mixture into the pan of milk. Whisk well until smooth. Pour into a container with a tight-fitting lid and place the container into the ice bath until cool, ensuring that the water level doesn't come up as far as the lid. When the mixture seems mostly cool, refrigerate until completely cold. Freeze ice cream according to manufacturers instructions. While the ice cream is churning, drizzle in the cold lemon syrup. Add the poppy seeds. When ice cream is done, scoop into a lidded freezer-safe container and press a piece of wax paper onto the surface of the ice cream. Seal container and freeze until firm, at least 4 hours.